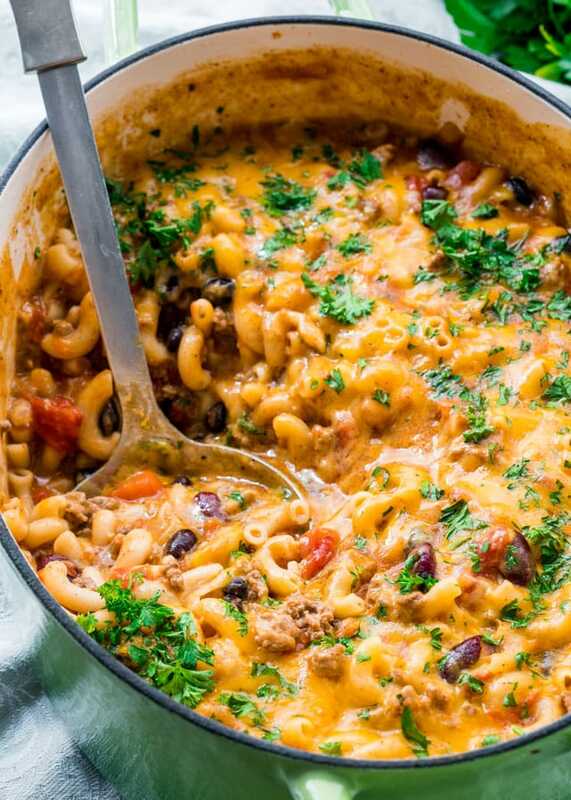 This One Pot Chili Mac and Cheese combines two great comfort foods all in one! Delicious and hearty, quick and comforting, perfect dinner for back to school and ready in under 30 minutes. I can’t believe that summer is almost over, only a couple days left but fall has been in the air now for a couple weeks here. I must say I love it, not so much the colder weather, but the colors of the trees changing. It really is beautiful and as much as I love my summer weather and my flip flops, I do enjoy the short fall we do have here. 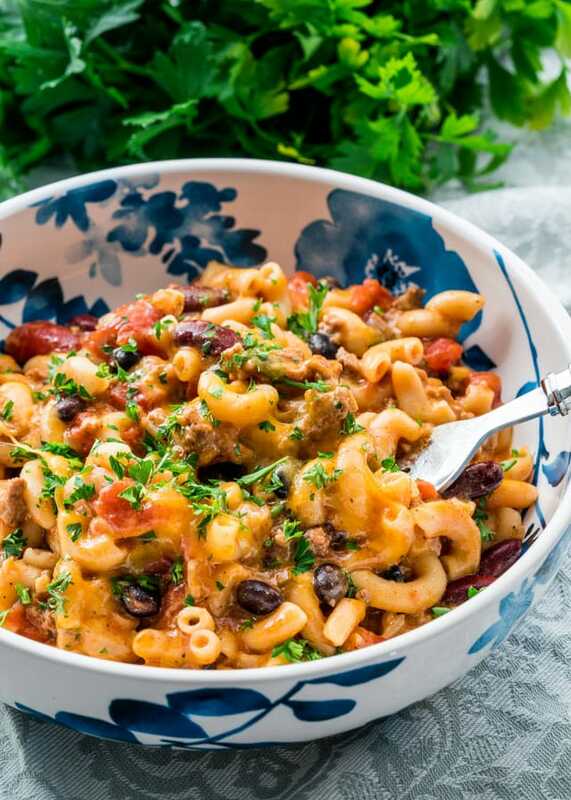 Which is what brings me to this dish, chili mac and cheese, which I think is perfect for this time of year. This dish is perfect in many ways. It’s made in one pot, it’s done in 30 minutes which makes it the perfect for back to school dinners, and most importantly it’s the epitome of comfort food. It’s one of those dishes that you wish to keep eating once you start. 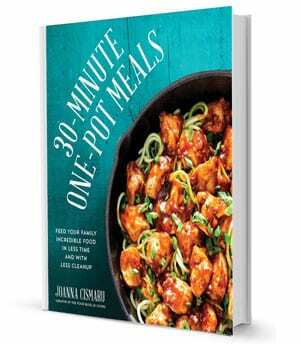 It really is a one pot wonder! 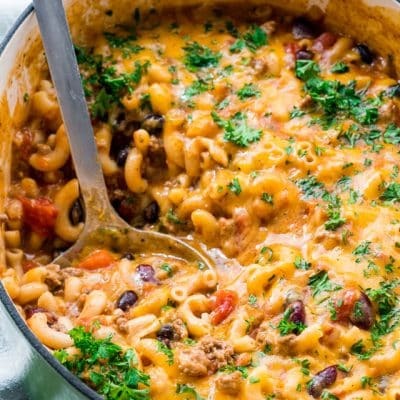 This one pot dinner is for both the chili lovers and the mac and cheese lovers, it’s everything you love in one bowl. There’s just something special and comforting about a piping hot bowl of chili. 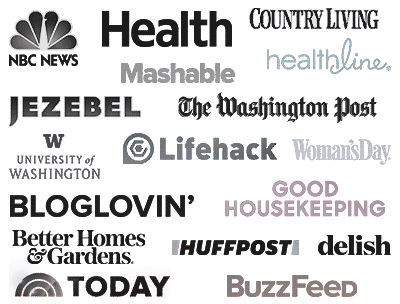 The ingredients are simple and you probably have everything on hand already, and it’s a great dish to clean up your pantry, use up some of those beans and canned tomatoes, and I know I always always have elbow macaroni in my pantry. Lots of it, not just elbow macaroni but all sorts of pasta. Sometimes I think I’m obsessed with pasta, because I cannot make a trip to my Italian market without filling up my cart with pasta. I prefer to use a good sharp cheddar cheese and lots of it. You could however use a blend of cheddar cheese and mozzarella cheese. Monterey Jack would also work wonderfully in this recipe. 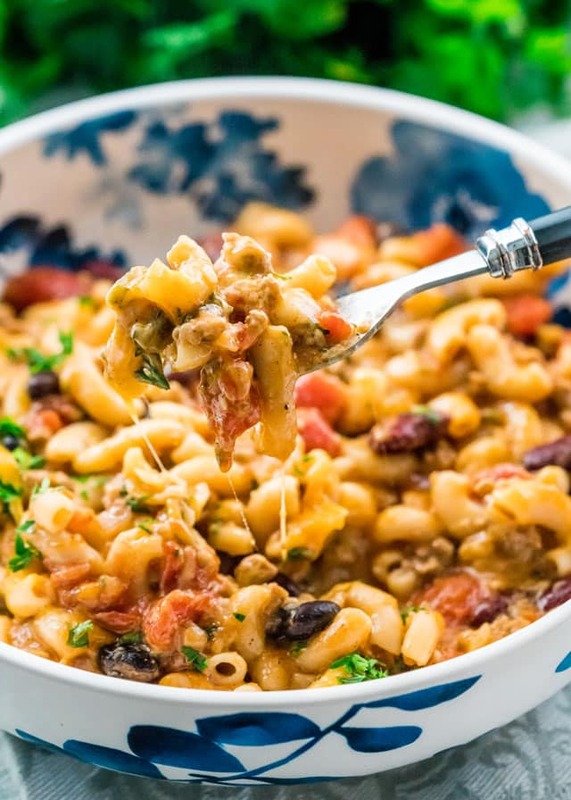 This recipe will also make quite a bit of chili mac and cheese, so there will be plenty of leftovers to take to work the next day. I would also recommend buying a good chili powder and using that because it really does make all the difference. 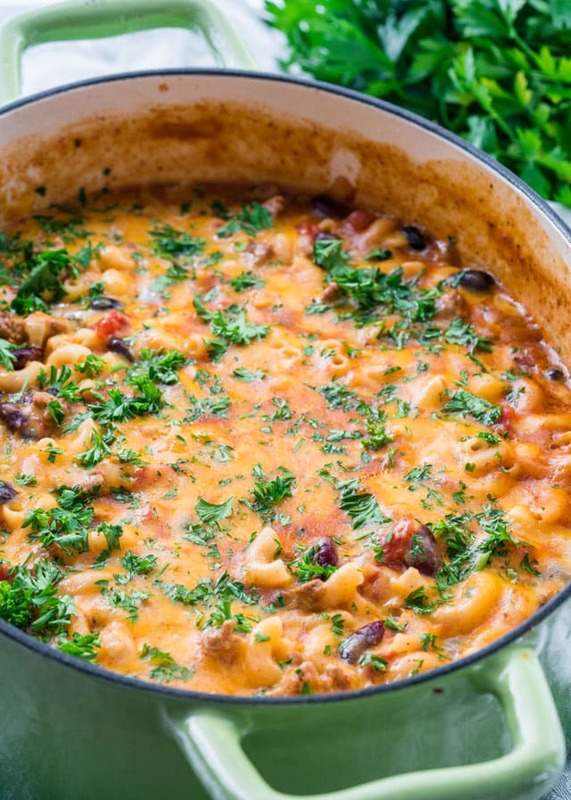 Hope you give this one pot wonder a try! Stir in 1 cup of the shredded cheese then sprinkle the remaining cheddar cheese over the top. Cover the pot for about 1 minute just until the cheese melts. The elbow macaroni can be replaced with any shape pasta. Oh, this was so good and simple! I only omitted the red pepper because of my kids. I will definitely be making this again! Any tips for doubling this recipe? I am making it for a work holiday party! If you hover your mouse over the number of servings in the recipe card, you can adjust the recipe to suit how many people you need to feed! I am eating this as I am typing my review. lol! I love the idea of one pot and not having to boil the elbows separately. This has just the right amount of kick to it and we loved the Mexican spices too. Hubs likes it real spicy so we may add sliced jalapeños next time. Another winning recipe from Jo! So happy you liked it, Lynda!